James Salmons with one of the 30lb carp he caught at Northey Park. 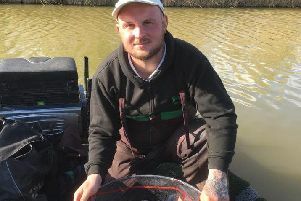 Northey Park is a local fishery that rarely hits the headlines but I reckon that’s all going to change sooner rather than later after all the hard work owner Elliott Symak has put into it over the past year. For a start he made the wise move to install otter fencing around his syndicate water, Patsons, to protect the huge carp that reside there and which attract anglers from all over the country. There may just be membership places left on the Syndicate Lake where you could catch the fish of a lifetime as they run to 40lb plus. James Salmons had two 30-pounders only last week. The three day ticket waters - Canal, Holly and Birch - are a joy to fish and tickets are just £6 (closed Mondays and Tuesdays). The gates open at 8am and close an hour before dark.